The Sunday School Department of Christ Apostolic Church Worldwide has unveiled plans for 42nd Decentralized Sunday School Rally. The Eastern Bloc of the rally will hold at CAC Idaw River, Enugu DCC Headquarters, between March 6th and 9th, 2019, while the Western Bloc holds at Babalola Memorial Int'l Miracle Camp, Ikeji Arakeji, Osun State between March 20th and 23rd, 2019. Similarly, Kano Centre holds at CAC Kuje DCC Headquarters., Abuja between April 3rd and 6th 2019. Also, Jos Centre holds at CAC Jos DCC Headquarters between April 3rd and 6th, 2019. The registration fee for the rally is N1000. 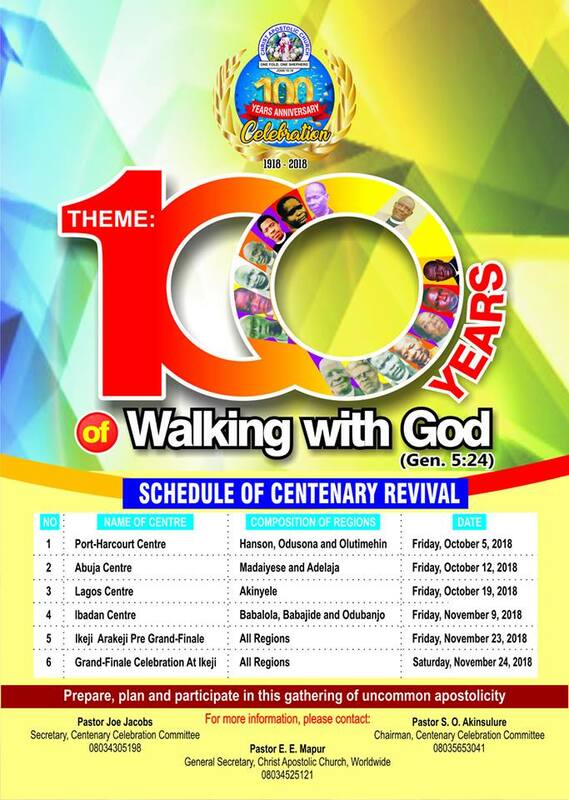 Major features of the rally are songspiration, seminar, drama, lectures, revival and many more. 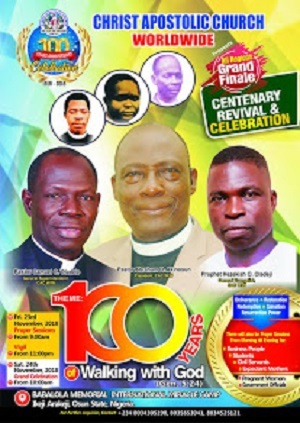 Guest speakers for the rally are the General Superintendent of CAC Worldwide, Pastor S.O Oladele, retired and immediately past Regional Superintendent of CAC Odubanjo Region, Pastor S.O. Akinsulure, DCC Superintendent of CAC Olorunsogo DCC, Pastor O. C. Chukwuezie, Regional Superintendent of CAC Medaiyese Region, Pastor G. C. Osuigbo, DCC Superintendent of CAC Ayetoro DCC, Pastor C. B. Famuyide and Assistant Sunday Director, Pastor Sam Falade among others.